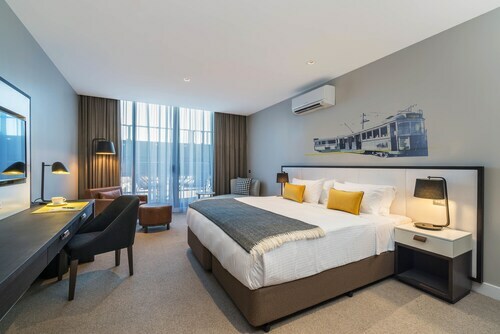 This family-friendly South Wharf hotel is located on the riverwalk, just steps from Southbank Promenade and DFO South Wharf. Yarra Riverfront is 0.1 mi (0.1 km) away. 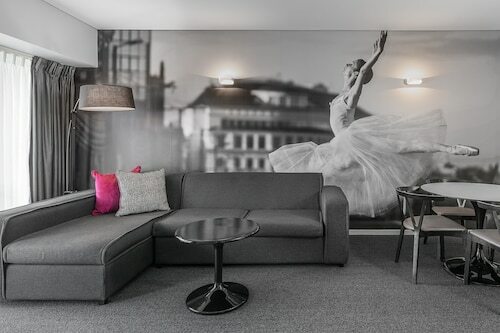 Located in Melbourne Central Business District, this hotel is steps from Southbank Promenade, Melbourne Convention and Exhibition Centre, and DFO South Wharf. SEA LIFE Melbourne and Marvel Stadium are also within 1 mi (2 km). Southern Cross Station is 18 minutes by foot and Flinders Street Station is 25 minutes. 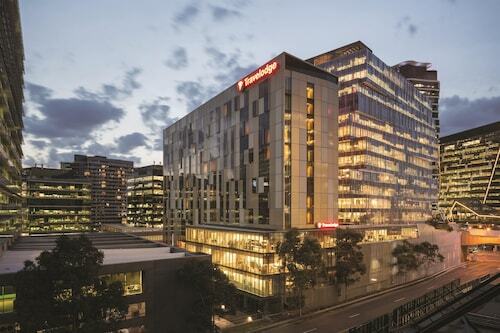 Located in Melbourne Central Business District, this hotel is within 1 mi (2 km) of Marvel Stadium and Melbourne Central. The District Docklands and Melbourne Cricket Ground are also within 2 mi (3 km). Southern Cross Station is 6 minutes by foot and Flagstaff Station is 19 minutes. 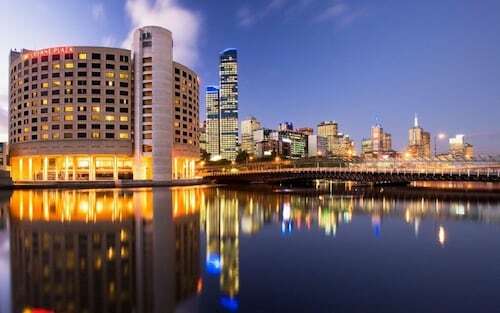 Located in Melbourne Central Business District, this hotel is within a 5-minute walk of Southbank Promenade and SEA LIFE Melbourne. DFO South Wharf and Marvel Stadium are also within 1 mi (2 km). Southern Cross Station is 6 minutes by foot and Flagstaff Station is 18 minutes. 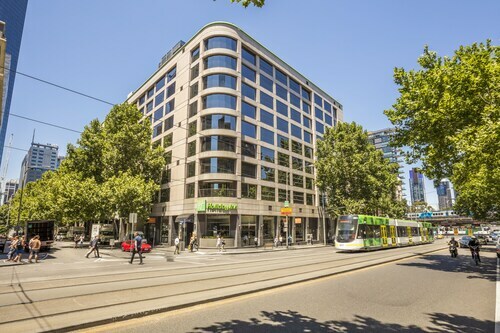 Located in Melbourne Central Business District, this hotel is within a 5-minute walk of Collins Street and SEA LIFE Melbourne. Melbourne Convention and Exhibition Centre and Flinders Lane are also within 15 minutes. Southern Cross Station is 5 minutes by foot and Flagstaff Station is 18 minutes. The Savoy Hotel On Little Collins Melbourne is located only a couple of blocks from the hub of Melbourne's Collins Street. Southern Cross Station, Marvel Stadium, Melbourne Aquarium, and the Melbourne Convention Centre are all within a quarter mile (0.5 km). 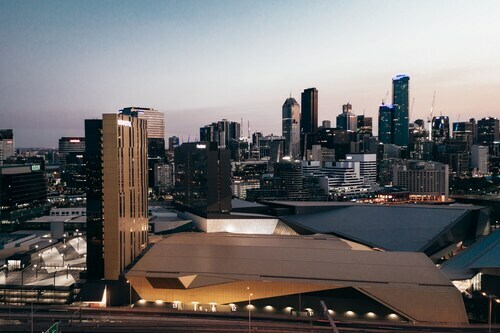 Located in Melbourne Central Business District, this luxury hotel is within a 15-minute walk of Marvel Stadium and Melbourne Star Observation Wheel. Melbourne Central and Melbourne Convention and Exhibition Centre are also within 1 mi (2 km). Flagstaff Station is 14 minutes by foot and Southern Cross Station is 12 minutes. Planning on heading to DFO South Wharf? 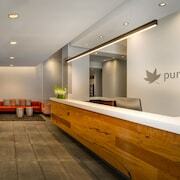 From hotels to surrounding attractions, here are a few things to think about before you book. You're not likely to have any issues finding it. It's located in Melbourne, the state capital. 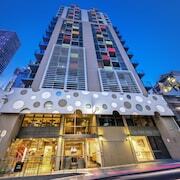 You'll discover a huge range of accommodation here, with as many as 48 within minutes of DFO South Wharf. Not sure where to begin? 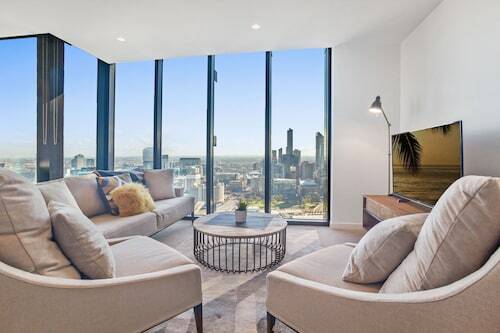 Compare the Docklands Executive Apartments, InterContinental Melbourne The Rialto and Melbourne Short Stay Apartments on Whiteman. Don't leave yourself dirt poor! There's a selection of suitable budget rooms nearby. See what you think of the Nomads Melbourne or the Urban Central Accommodation - Hostel, 2 kilometres and 0.8 kilometres away, respectively. That said, you could always treat yourself to one of the many top-notch hotels in the surrounding area. 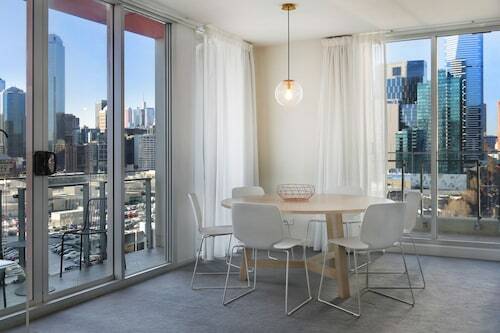 Check out the amenities at the AKOM Docklands, a kilometre away. Otherwise, the Crown Towers is only a kilometre away. Don't want to go far for your morning coffee? Try Degani - World Trade Centre. It's really close to DFO South Wharf. When you couldn't possible go on before quieting your growling stomach, visit Vibe Savoy Hotel. 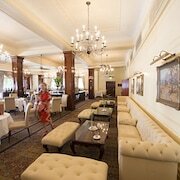 If you'd like to kick back with a bottle of wine, Quest Grand Hotel Melbourne is the perfect place. Check if something's on at Melbourne Convention and Exhibition Centre. You'll be wrapped with the venue! Learn about the area's water transport history via informative displays and artefacts at Polly Woodside. If you're looking to fill in a few hours, take in the collections at Victoria Police Museum. Roll the dice at Crown Casino and Entertainment Complex if you want a few rounds of blackjack or bingo. Melbourne Aquarium showcases the wonderful critters of the ocean. Leave your car behind and cruise to DFO South Wharf by train. Flinders Street Railway Station, the closest station, is just 2 kilometres away. How Much is a Hotel Room in DFO South Wharf? 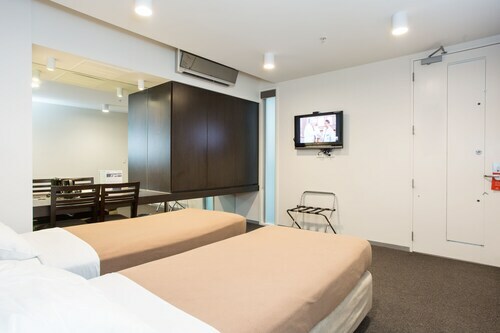 Hotels in DFO South Wharf start at AU$79 per night. Prices and availability subject to change. Additional terms may apply.